Dare I say they are my favorite breakfast? I would choose an Egg McMuffin over berry-filled crepes, a Belgian waffle, or an avocado-stuffed breakfast burrito any day. However, I’ve seen Super Size Me and realize that eating at McDonalds too often can result in a larger waist, higher cholesterol, and a spectrum of other health problems. So I limit myself to eating Egg McMuffins once (or twice) a month. I haven’t cut down on my beloved egg sandwich. Nearly every Saturday and Sunday morning I eat a breakfast sandwich–replacing McDonald’s American cheese and fully cooked egg with goat cheese, gouda, or manchego and a fried, over-easy or poached egg. 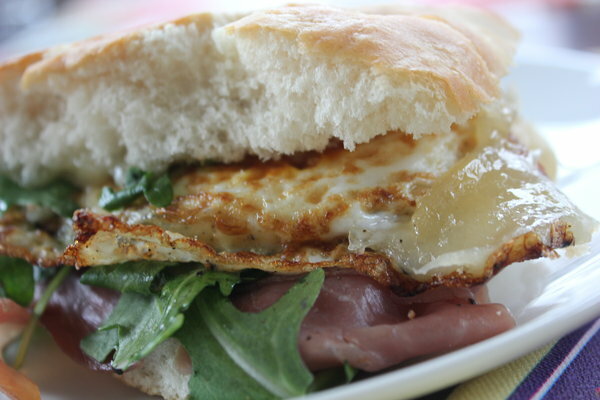 One of the best things about a homemade breakfast sandwich? Eggs and bread are inexpensive so you have a few extra dollars to spend on ingredients like prosciutto and Gruyere. This weekend I made an Italian delight: a prosciutto and arugula sandwich with a fried egg and Gruyere on grilled ciabatta. A perfect combination of salty meat, melted cheese, and runny egg to welcome in the first weekend in March. Alex Milling is a recent graduate of Northwestern University and loves the month of March. Place a frying pan over medium heat. When warm, coat with cooking spray and the crack the eggs over pan. Season eggs with pepper and a pinch of salt, and let cook for 3 minutes. Flip eggs, sprinkle with an additional pinch of pepper and let cook two minutes. Place a slice of Gruyere over each egg and cook for one additional minute, or until cheese melts. Then remove pan from heat. Cut the large ciabbata roll in half in order to create two rolls. Then split each roll open and place one piece of prosciutto on the bottom half of each. Layer roughly 10 arugula leaves on each roll. Add egg and cheese on top of the arugula. Finally, finish sandwich with the top of the roll. I like to finish off the sandwich by grilling it in my George Foreman for 3-4 minutes. If you don’t have a George Foreman (or panini press) the sandwich is also delicious as is!